Hancocks are internationally recognised as one of the leading authorities in the world of diamonds and precious gemstones. Hancocks are Manchester’s oldest fine jewellers, their origins began in the city in 1860, when Napoleon III was about to invade Prussia. At that time Manchester was the beating heart of the cotton industry, and trade and commerce brought success and great wealth to the city’s merchants and “cotton kings”. Against this background, Josiah Hancock of Manchester plied his trade as a clock winder to the gentry, visiting the country homes and mansions of the nobility and industrial barons, on his weekly winding round. A few years later, he opened a shop in Piccadilly and as his business thrived, he moved to 29 King Street, still occupied by Hancocks today. The Hancocks archive catalogues illustrate the jewellery fashions of the 1950s – with their curving gold and gem set lines, chunky bracelets and iconic cocktail rings. The abstract forms of the 1960s, by the leading designers of the day, on to the 1970s and 80s and an array of suites of coloured stones, coral, malachite, onyx with scattered diamond frosting. The tables turn again, to the present accent on the classic, its concentration focused on superb quality diamonds, rubies, sapphires and emeralds. Jewellery styles change, but Hancocks’ perfection is timeless. Over 150 years have passed since Josiah Hancock founded the business, and it is still in private ownership today. In these days of constant change, that stability is rare. Hancocks jewellery today is still of the finest design and craftsmanship, with great effort being employed in designing the pieces, and choosing the stones, to create the most desirable collection in the North West. 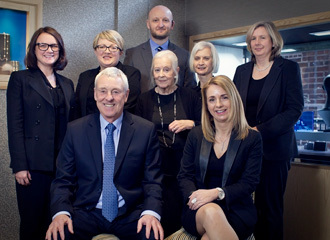 Hancocks’ professional sales team pride themselves on providing a discreet and specialist service, in many cases to the third generation of a client’s family. Hancocks stress the importance of their continuous attention to the purchase, providing a cleaning and checking service to ensure the jewellery always provides pleasure to the wearer, this service is of course free of charge. Hancocks epitomise quality, and with this in mind, if a customer wishes to upgrade a diamond purchased from ourselves, they would receive the full amount that had originally been paid for that item. In the 21st century Hancocks continue to provide the finest jewellery for those who appreciate the Hancocks style.